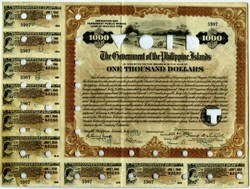 Beautifully engraved $1000 Bond certificate from the Government of the Philippine Islands issued in 1923. This historic document was printed by the American Banknote Company and has an ornate border around it with an image farm workers. This cancelled bond has the printed signatures of the Major General, U. S. Army, Frank McIntyre, and the Philippine Goeverment General, and Treasurer. This bond is over 93 years old. Washington, D.C. and Manila, Philippine Islands, July 15th, 1922. $1000, 30 Year, 4 1/2% "Irrigation and Permanent Public Works Loan of 1922 due 1952 - Act of the Philippine Legislature Number 3013". Issued and handstamp and punch cancelled, Brown border and brown underprint with workers in field, S/N 5907, "VOID" cut cancelled into bond on right side, Speelman facsimile signature on bottom middle, 10 coupons attached to bottom and left side that are punch and ink cancelled, bond back has text "Act of Congress, Aug.29, 1916, July 21, 1921, May 31, 1922 - Coupon Bond Number 5907 - The Government of the Philippine Islands. Text of the bond states "This bond is issued in accordance with the provisions of an Act of Congress Approved Aug.(29, 1916) entitled "An Act to declare the purpose of the people of the United States as to the political status of the people of the Philippine Islands and to provide a more autonomous government for those Islands" as amended by an Act of Congress approved July 21, 1921 as amended by an Act of Congress approved May 31, 1922.....exempt from taxation by the Government of the U.S.....Washington, 1922". Overall condition is VF with toning with multiple Punch cancels on the bond and a punch "VOID" cancel. Bureau of Engraving and Printing without imprint. BEP. Rare Philippine bond.